BEACH FRONT PENTHOUSE, 3 LARGE BALCONIES, SEA AND MOUNTAIN VIEWS, SUN ALL DAY. Luxury dream PENTHOUSE apartment on the fifth floor has 3 ENORMOUS balconies.800sq.feet with 360 degrees sea and mountain views. The sun shines on these balconies all day. This MAGNIFICENT apartment is approx. 2000sq.ft. ON THE BEACH! Andalucia Del Mar is in Puerto Banus, Costa Del Sol and shares the same beach with Club Playas del Duque, being less than 50 meters apart. 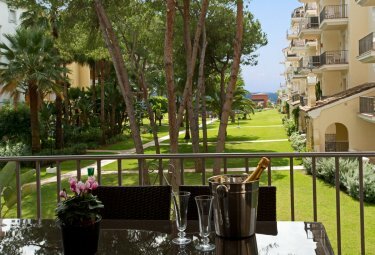 This is a prestigious and sought after development where you can simply step out of the garden directly on to the sandy beach and into the soothing waters of the Mediterranean sea. Located in a wonderfully unique, natural setting, enjoying an exceptional climate, this apartment offers every possible comfort for your stay. 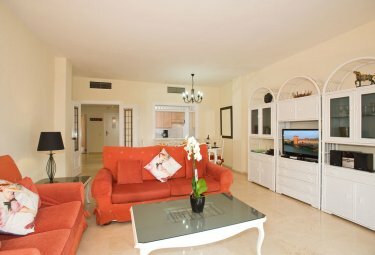 We offer the highest quality in a peaceful development, within private tropical gardens, yet only a few minutes walk from the opulent social life of Marina Puerto Banus in Marbella. Our tropical gardens have 2 swimming pools. This very safe and secure development is located directly on the beach with a security gate opening onto the Blue Flag sandy beach, into the inviting Mediterranean sea and the lavish Ocean Club with its fabulous huge seawater swimming pool. Also this security gate leads into the famous PUERTO BANUS MARINA which is a two minute walk either along the sandy beach or by using the boardwalk. The gardens and apartment are wheelchair and push-chair friendly. The boardwalk is accessible from our garden gate which makes the beach and Marina Puerto Banus so easy to navigate. We have a 24/7 hours key collection service facilitating your arrival and departure times making them totally flexible and at your convenience. In the adjacent building you will find the most luxurious exclusive health and beauty SPA with its own indoor heated swimming pool, well equipped gym, exercise classes, sauna, steam room and Turkish hammam as well as conventional massage treatments. (Reasonable entrance fee payable directly to the club). In the same adjacent building where you collect the keys, there is a 24/7 supermarket, pharmacy, restaurants and cafes. Puerto Banus is the most loved resort in Spain enjoying a sunny micro climate protected by the magnificent Sierra Blanca Mountain range. Apart from the world famous marina, displaying multimillion pound yachts, it has wonderful sandy beaches, restaurants, beauty salons, cinemas, art galleries, designer boutiques, department stores, post office, bakery, English newspaper shop, pharmacy, medical services, alfresco cafes, plenty of nightlife, bars, banks, casino, bridge clubs, cinema, all water sports, bowling alley, horseback riding, bowling green, tennis and golf clubs, play grounds, water parks, crocodile farm, dolphin excursions, tours to the mountain villages, Gibraltar and across the waters into Morocco. YOU DEFINITELY DO NOT NEED A CAR when holidaying in one of our apartments as everything you need is immediately accessible or just a few minutes' walk. However, we do include a designated car space inside the building accessible by elevator from the apartment, should you require it and at no extra charge. Malaga or Gibraltar airports are 35 minutes drive. Information on airport collection and car hire is available. South facing, Extremely spacious 211 square meters or 2271 square feet in size. An up upscale, comfortable and luxuriously decorated apartment with air conditioning throughout. The lounge balcony and the master bedroom have stunning views of the manicured gardens, swimming pools plus amazing SEA and Sierra Blanca MOUNTAIN VIEWS. Dine alfresco for breakfast, lunch or dinner as the main lounge balcony has a smart rattan dining table for six with views of the swimming pools, the park like tropical gardens and sea view. Comfortable black sunbeds adorn the balcony off the lounge should you wish to stay and take in the views while you sunbathe. A huge parasol is in situ to protect the delicate. Many guests find it difficult to tear themselves away from the enjoyment that this penthouse with its' huge balconies bring. The spacious lounge and dining areas are luxuriously appointed with high quality furnishings, contemporary black lacquer dining suite for 6 diners with matching sideboard and cocktail cabinet, flat screen Satellite TV with UK and other European Channels plus DVD player. The apartment is centrally air conditioned for heating and cooling throughout. WiFi and additional cleaning are available upon request. This apartment has two bedrooms, two bathrooms and sleeps up to 6 people. Generously sized master bedroom, tastefully decorated with high quality furnishings, a luxury quality super king size bed with tempur style mattresses plus fitted wardrobes. The en-suite bathroom is all marble, full bath tub/shower, WC, bidet, twin vanity unit. Round stone table with chairs on the second balcony directly off the master bedroom is ideal for breakfast or to enjoy a cocktail or two whilst you watch the sun go down. Contemporary guest bedroom with twin beds and fitted wardrobes, its own balcony with table and chairs. Enjoy the wonderful mountain views. Guest bathroom is all marble, with full bath tub/shower, bidet, WC and vanity unit. The modern kitchen with granite work tops is fully fitted with fridge/freezer, microwave, dishwasher, electric hob and oven, washing machine and separate clothes dryer, electric kettle, coffee maker. All cutlery, crockery, utensils etc are provided. There is a convenient serving hatch from the kitchen to the dining area. - A parking space in our underground garage. - Linens, towels and pool towels. - Baby cots and high chairs are available on request. - Air conditioning, cooling / heating throughout. - Satellite TV with UK and many European channels. - Hair dryer in each bedroom. - Steam iron and ironing board. - Sterling or Euro bank transfers. and it's not necessary to have an account with PayPal to make a transaction. We provide an up to date folder in the apartment, giving lots of information about the local areas of interest, leaflets on tours and activities, restaurants and take away menus, emergency service contact details etc. Every Saturday morning there is a popular street market at the Bullring in Puerto Banus. This market is the largest open market on the Costa Del Sol. There are eight Andalusian provinces, a journey around the lands of Almer�a, Cadiz, Cordoba, Granada, Malaga, Huelva, Ja�n and Seville. Each so close, and yet each so different...Hidden throughout the length and breadth of the rich geography of Andalusia's eight provinces are lovely cities which deserve a privileged position for their beauty, their priceless architectural heritage, or simply for their traditions. Daily tours are available from here to all these provinces plus Gibraltar and Morocco. If you are a golfer, this is Costa Del Golf - Golf experience holidays. Within the length of this coast, there are over fifty spectacular golf courses offering international standards and designs. The golf clubs are available for anyone to play and to use all their facilities without membership restrictions - daily entrance fees apply. The area boasts some of the best golf courses in Europe including, but not limited to the Valderama course which hosted the 1997 Ryder Cup and the American Express Match Play Championships. In Puerto Banus you are located in the centre of the Golfing environment where there are 5 world renowned Golf Courses. Centrally; Las Brisas, Aloha, La Quinta, Los Naranjos and Dame de Notche for night golf and there are many other courses to the East and to the West within half an hour's drive in either direction. Marbella Golf and Country Club, Santa Maria, La Cala Resort, Miraflores, Cabopino with wonderful views, Torrequabrada, Mijas Golf is a busy course, La Noria is flat 9 holes. Our apartment capacity is 6 people. Special rates and offers available for long term and last minute. Our prices are based on a family of up to 4 people. Car parking is included although you would not need a car here. Subject to availability, we can accept bookings for less than a week.